Should we try to make parking spaces extinct? As Joni Mitchell put it “they paved paradise and put up a parking lot.” Unfortunately, she was right. Currently the global number of off street parking spaces is undetermined but estimates for the number in the U.S alone runs from 105 million to 2 billion spaces. That’s between 2,940 - 56,000km2 of paradise that we’ve paved over. To put it into perspective, the average parking space requires about 28m2 (300 ft2). This is the average size of a studio apartment in New York, or two studios in Hong Kong (12 m2, 128 ft2) - enough room to hold 10 bicycles. Overall, estimates show that in some cities, one third of the surface area is taken up by parking facilities. We should look into bringing the parking space back to human space – unpave and transform. Doing so will help alleviate a multitude of efficiency and sustainability issues. For example, the “fundamental rule” of road congestion is that adding road capacity just increases the total number of kilometers traveled by vehicles. This also applies to parking spaces, somewhat. The result of too many parking spaces is increased traffic, reduced valuable space and increased housing costs. Each of these are consequences of more parking spaces that encourage more driving. Why should we talk about parking? Finding parking in congested cities takes on average 8 minutes for every journey. In the U.S, drivers waste up to 107 hours every year in cities like New York. This equates to an average cost of US$20 billion a year in the USA alone. The British also waste on average four days a year in search of parking. Separately, researchers found that 30% of emissions from road transport are caused due to traffic congestion instigated by people searching for parking. Additionally, clustered parking spaces create “heat islands” and sources of polluted storm water runoff. They hollow out cities and divide neighborhoods. Arguably, they also create traffic by incentivizing driving, making life less convenient for people who have no choice but to drive. In other words, parking wastes time, ruins landscapes and contributes to pollution and climate change. What’s not to like? Today, humanity is experiencing rapid urbanization. By 2050, 70% of the population will live in cities. As the global population moves to cities, mobility preferences are changing. Digital technology will continue to form more of the backbone of mobility in the future. For example, a recent estimate says two million people in Los Angeles, California will give up their cars for autonomous ride hailing in the next 15 years. Digitalization and the internet of things are providing real time data on parking availability as well as dynamic prices (a pricing strategy which applies variable prices instead of fixed prices according to supply and demand) for parking spaces. An initial pilot project ran in San Francisco found dynamic parking pricing to have a time saving of 43%. This helped alleviate city congestion reducing time wasted stuck in traffic, ultimately positively affecting GDP and health by reducing emissions from road transport. Siemens recognizes the potential impact and has created an integrated smart parking solution which stands to remove the frustration when it comes to finding a parking. Other cities like Zurich have put a cap on parking spaces. Now, its streets are even more amenable to walking, cycling and transit use than ever before. 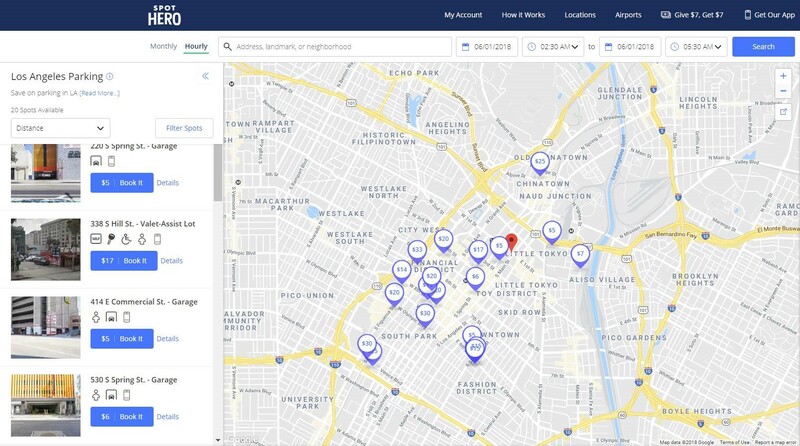 Spot Hero also provides a great example of using existing technology to provide live updates to car users on parking availability in different cities with the added benefit of booking your space in advance. The image below shows parking availability in L.A. notorious for its terrible traffic. This solution together with dynamic parking prices could, in the future further help alleviate road congestion and reduce emissions from road transport. We need to transform the parking space into “people” space, building a mobility system that is built for the movement of people, not cars. This is easier said than done as the topic of parking space in cities is often a political one involving mandated planning policies. In addition to technological solutions, a cost-effective, integrated parking management program (explained through example below) can often reduce parking requirements by 20–40%, while improving user convenience and helping to achieve other planning objectives, such as supporting more compact development, encouraging use of alternative modes, and increasing development affordability. Copenhagen, Denmark, provides a great success story with many learnings from introducing their integrated traffic management strategy in the city center. Strøget, Copenhagen’s main street, was pedestrianized on 17 November 1962. This conversion was hotly debated at the time. People argued that a pedestrian street in Denmark would never work. However, although skepticism was high, the new car free environment proved extremely popular with residents from the first day. Today, the city of Copenhagen has over 96,000 m2 (of which 33 % is street and 67 % city squares) of car-free space. Having reduced car traffic in the core of their city, congestion is no longer a problem in Copenhagen. The key to success for this inner-city transformation was undoubtedly the gradual way these rather drastic changes were made. Their incremental approach has given residents time to adapt, to change from driving and parking their cars to walking, using bicycles and public transport. What could the removal of the parking space look like? Imagine a world where cities are designed to favor the movement of people, rather than simply the movement of vehicles. To do so, public authorities work in collaboration with urban planners to change or remove parking mandates to transform car space to human space – like parks, walkways or bike paths. A recent report released by the International Transport Forum (ITF) suggested the car fleet needed for daily commuting could be reduced to 3% of today’s fleet. Cars won’t require parking, because of shared mobility and high utilization rates, reducing their idle time from 95 to 5%. Instead of releasing emissions from car tailpipes as we waste our time stuck in congested city streets due to people searching for parking, we can reduce up to 30% of emissions from road transport. Solutions already exist that will make use of technology to help us solve problems relating to parking – but behavior also needs to change. People need to be willing to use multi-modal transport along their daily journeys – from trams, to busses, to bikes, to cars and walking. We all need to work together and transform the mobility ecosystem to one that is built for better movement of people, because it’s us who need to move from place to place.